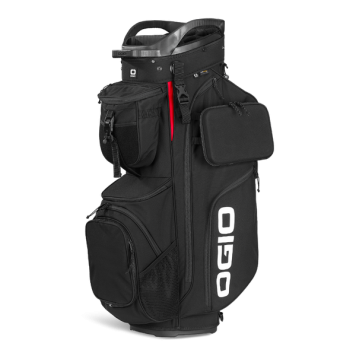 The OGIO ALPHA Convoy 514 Cart Bag is the ultimate rider companion with hand selected materials, intuitive organization, and exceptional durability. Built with 600D CORDURA® Eco Fabric, a strong polyester made from recycled plastics, the ALPHA Convoy 514 Cart Bag is not only ultra-durable, but sustainable. Self-finding Fidlock® magnetic closures allow easy, quick-access interactions for the strap pass-through and towel loop. ALPHA Convoy’s signature MOD Technology completes this bag providing intuitive, customizable storage for anything you need.